Not only am I prepping my home for Spring with all my organization and cleaning projects, but I’m also working on getting myself ready too! That includes booking an appointment for a haircut, pedicure and getting my legs ready for short and skirt weather. I admit I got a bit lazy during the winter months and didn’t shave my legs as often as I do in the the summer months. However, it’s time to get them into tiptop shape. No more excuses! I was compensated for this post. All opinions are my own. Are you ready for some pampering and getting your legs into silky smooth shape? My friends at Skintimate have a few tips on how you can achieve a luxuriously close-shave and have your legs looking their best! 1. Wash your skin with soap in the bath or shower. This helps to eliminate any residual oil, dirt or grime left on the skin. It also softens the hair making it easier to shave. 2. Exfoliate. My esthetician recommended exfoliation a few years ago as a way to prevent ingrown hairs. Back then, I was getting my legs waxed and ingrown hairs were my nemesis. Exfoliating my legs twice a week nipped that issue. Use a moisture-rich scrub to buff away dead skin particles and expose more of the hair. This extra step will help you get a closer shave. 3. Apply a Moisture-rich shave product to your skin. Try Skintimate® Skin Therapy® Silky Skin Shave Gel with Moroccan Oil to combat dry skin and help you achieve a close, comfortable shave. It has Moroccan Oil with Vitamin E, Olive Butter and Sunflower Seed Oil to replenish your skin’s natural moisture. My skin drinks this rich lotionized gel up! My legs were dry after the long cold winter and in much need of some extra moisture. I love how silky smooth it makes my legs feel after shaving. 4. Use a good quality razor. 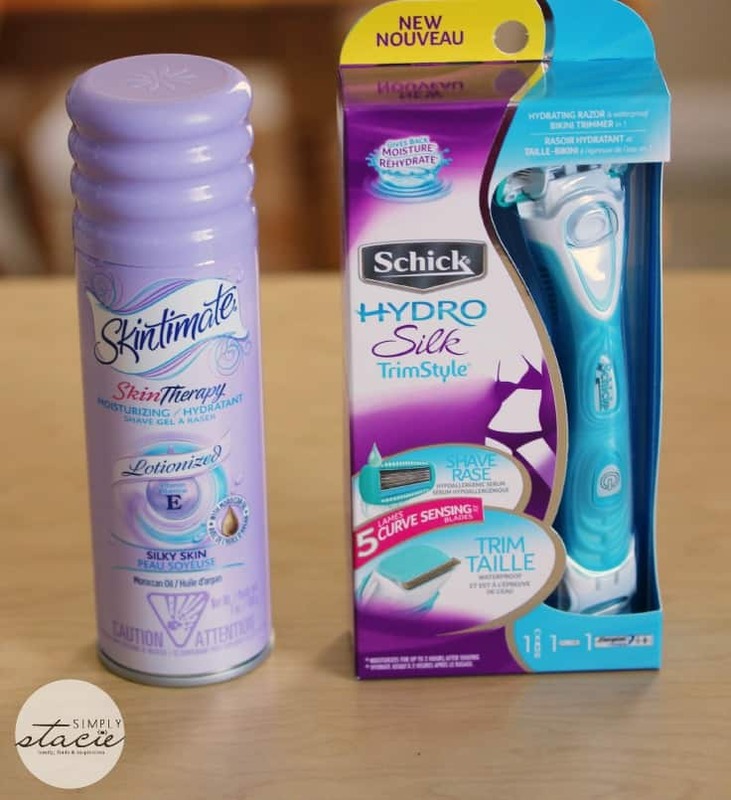 I like Schick® Hydro Silk® TrimStyle razor. It has five curve sensing blades giving you an incredibly close shave. It also has hypoallergenic moisturizing serum and unique skin guards to protect against irritation. I don’t notice any razor burn or redness when I use it. I also appreciate that I’m not nicking myself in the tough to shave spots like the knees and ankles. I still have scars from old shaving injuries when I wasn’t using a good quality razor! 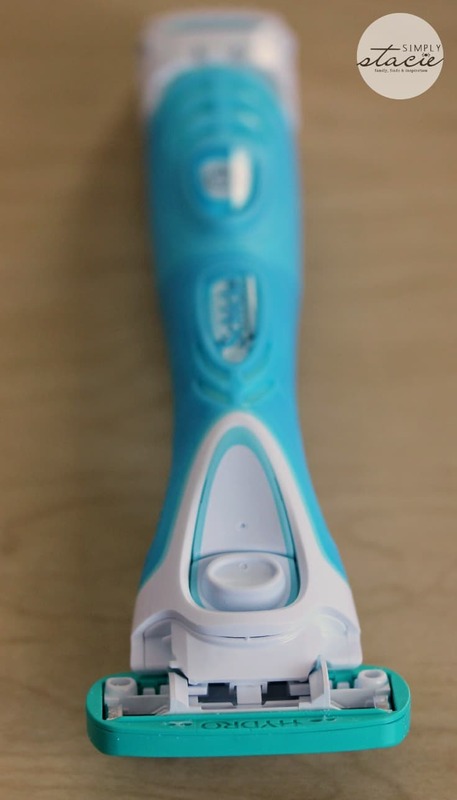 Also, this razor does double-duty as a bikini trimmer! Use it in or out of the shower to get bathing suit ready too. 5. Pat your skin dry. After you’ve rinsed off your legs, pat your skin dry with a soft towel. Don’t rub it! Want to try Skintimate® Skin Therapy® Silky Skin Shave Gel with Moroccan Oil? Look for it at your local major food, drug or mass retail outlet for a SRP of $3.49. How do you prep your legs for the nicer weather? Exfoliate then shave followed by mega moisturizer! I shave and moisturize them. Definitely keep my legs smooth and moisturized, and with a bit of tan is the best. I use lots of lotion so my skin doesn’t dry out. With a combination of shaving and applying a moisturising sunscreen. I like to shave and moisturize. I shave my legs with soap and water and then moisturizer. Thank you! nice my wife would love this. I exfoliate and use body lotion. I use lotion most of the time. And thank you for the entry. I make sure to moisturize more often! I shave and moisturize more often. I shave my legs weekly and apply moisture lotion daily! I prep my legs for the nicer weather the same way as thru the winter – shave & lotion. Dry skin in the winter is just as bad as dry skin in summer. Nothing fancy, I keep my legs shaved and moisturized year round. After chemo, my leg hair never grew back! BIG PLUS they never tell you about! But, conversely, my skin all over is very dry and needs so much more moisturizing than ever before. Also, I read that Marilyn Munro and Elizabeth Taylor shaved their faces daily to keep the dead skin exfoliated and their skin smooth — dying to try it but searching for a shave cream that isn’t drying — this sounds perfect!